Andrew Chapman has defeated Edward Betlow after hours of heads-up play to take home his first Circuit ring, $12,012, and 50 Casino Champion points. A full recap, and the winners photo, will be posted within the hour. Edward Betlow is all in on the 10♥8♥2♣ flop, and has been called by Andrew Chapman. The 3♠ turn gives Betlow trip threes, but the 9♥ river gives Chapman the straight flush, and the seven-six low to scoop, eliminating Betlow in 2nd place. Registration closed for the $250 Seniors event with 330 entries, which generated a prizepool of $64,020. The top 33 spots will get paid with a min-cash worth $384. The top spot will take home $15,044 and the gold Circuit ring. Event #8, the $365 no-limit hold'em event, has reached the unofficial final table of Ten. The players have redrawn for their new seats, and are now playing level 20 with 4,000/8,000 blinds, and a 1,000 ante. John Binns leads the final ten players, with 380,000. Just behind Binns is JeWook Oh with 378,000. The remaining players are all guaranteed at least $1,043, and the first place prize is $14,274. The Seniors event is now in the money, and the final 27 players are redrawing for their seats at the final three tables. They are currently in the midst of Level 15, with 4,000/8,000 blinds, and a 1,000 ante. The average chip stack is 122,222. Two of the notables still in the field include Bill Kitzerow ("Moshi's Dad"), and John Clifford. Registration is closed for Event #8, $365 no-limit hold'em event. This event drew a total of 183 entries, generating a prizepool of $54,900. The top 21 spots will get paid with a min-cash worth $609. The top spot will take home $14,274, the gold Circuit ring, and 50 Foxwoods Casino Champion points. Facing a raise from a player in middle position, Margaret Rowan moves all in for her remaining big bet. The board runs out Q♥6♦4♦Q♣5♦ giving Rowan's opponent the flush and an ace-three low to scoop, and eliminate Rowan in 9th place. Event #6, the only non-hold'em event of the series,has reached the unofficial final table of Ten. The players have redrawn for their new seats, and are now playing level 21 with 5,000/10,000 blinds, and 10,000/20,000 limits. The start of day chip leader Dino Moustakis leads the final ten players, with 227,000. The next closest players is Bob 'The Bus' Ferdinand, with 220,000. The remaining players are all guaranteed at least $879, and the first place prize is $12,012. 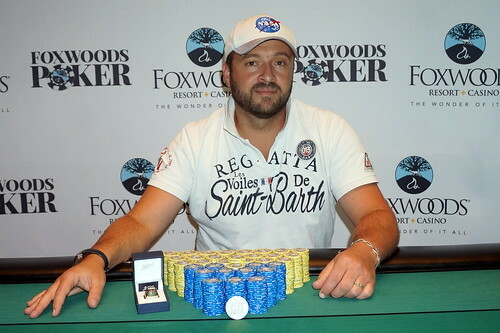 Olivier Lacoste has secured his first World Series of Poker (WSOP) Circuit ring and $17,640 after taking down the $580 No-Limit Hold'em Event #6 at Foxwoods Casino. Lacoste is here on the East Coast on holiday with his family from France. "It's truly a poker story," Lacoste explained, "I met my wife in 2009 at the World Series of Poker in Las Vegas, we got married, have two children, and now live in France. I am here in Massachusetts for three weeks on holiday visiting my wife's family, my in-laws. I decided to play this tournament, and now I have won a Circuit ring. Unbelievable." Lacoste defines himself as a recreational player. He used to play live and online in France, but now his job as a financial advisor, and his two children take precedence over poker. Lacoste was actually eliminated the very last hand before registration closed in this event. He flopped a set of queens against Foxwoods' regular Bobby Corcione's flopped set of aces. He quickly re-entered, and made his way into the money that night, and to the winner's spotlight the following afternoon. This will be the only tournament of the series that Lacoste is able to play due to family obligations, but he is very excited to have secured a WSOP ring, and hopes that he can also continue his run at the WSOP International Circuit stop in France in November 2017. The remaining 16 players are now hand for hand on the money bubble. Once one player is eliminated, they remaining 15 players will all be in the money and guaranteed at least $725. First place will take home $12,012, the World Series of Poker gold ring, and 50 Casino Champion points. Olivier Lacoste has just defeated Sean Thomson heads up in Event #6. A full winner story/recap will be posted later on this afternoon. Sean Thompson moves all in for his remaining 250,000 and Olivier Lacoste quickly calls. The board runs out A♣8♣4♦9♠5♠ awarding Lacoste the pot, and eliminating Thomson in 2nd place. The board reads K♣Q♥10♠6♦. Antonios Mouratidis checks, Olivier Lacoste bets around 90,000, and Mouratidis moves all in for his remaining 250,000. Mouratidis quickly calls, and the players table their cards. Unfortunately for Mouratidis the 2♦ on the river is of no help, and he is eliminated in 3rd place, taking home $7,868. At the end of Day 1, just 19 players remained. Those players bagged up their chips and will return to play Day 2 tomorrow (Wed. August 23rd) at 1:00 p.m. Play will resume at level 19, with 3,000/6,000 blinds, and 6,000/12,000 limits. At the end of the day, only three of the 126 entrants remain in Event #6. Olivier Lacoste, from France, leads the final three with 693,000. Play will resume at Level 22, with 6,000/12,000 blinds, and a 2,000 ante. Paul Freedman is the newest Circuit ring winner at Foxwoods casino after besting a field of 490 entries to take down the $365 Monster Stack event for $31,605. Freedman came into the final table third in chips, but after a long day of play, managed to defeat James George heads-up to secure the win. George took home $19,551 for his second place finish. Freedman gives partial credit to his father and grandfather for helping him win this event. Freedman lived next door to his grandfather who taught him how to play poker. Later in life, Freedman worked with his father for 40+ years, owning a company that bought and sold goods related to shoe making. He said that his grandfather and father both taugh him to work hard and appreciate the gifts he has been given. "Life has been very good to me," Freedman explained, "Life is very very good. Every day that I wake up is a good day."